Cabling is quite important to audio and video systems because it is the means which the signal moves from one device to another. The most prominent cabling nowadays is the AV cable. It is an analog system that uses individual cables for every signal that needs to be moved from one device to another. HDMI (High Definition Multimedia Interface) is another option that has been gaining widespread acceptance due to significant differences and advantages over the AV cables. The most significant difference is the fact that HDMI cables convey data digitally between devices. Being able to convey digital data meant that the signal from digital devices do not need to be converted to analog which usually results in quality degradation. This makes HDMI cables essential for high definition videos which starts off as digital signals which are usually displayed in LCD or plasma display which are also digital. Another substantial advantage of HDMI cables is the actual number of cables you would need. The very simplistic nature of AV cables also means that you cannot send multiple signals along a single cable. You would need two cables for stereo sound and another cable for composite videos. That number greatly increases with the use of component video which also requires 3 cables by itself. HDMI allows you to use a single cable to convey multiple signals. A single HDMI cable is capable of transmitting a video signal, a CEC signal so that your devices can communicate with each other, and up to 8 channels of audio signals. This allows you to simplify the mess of cables behind your devices since you probably wont need more than one cable to connect two devices. The digital nature of signals going through HDMI cables also makes it less susceptible to noise and other signals that might distort the image. AV cables transmit the original signal itself which makes it very susceptible to these problems especially when improperly shielded. This might not be that serious of a problem since most installations are done properly but the use of HDMI cables just makes it easier and less of a hassle to connect devices together. Ben Joan. "Difference Between HDMI Cable and AV Cable." DifferenceBetween.net. December 9, 2010 < http://www.differencebetween.net/object/difference-between-hdmi-cable-and-av-cable/ >. 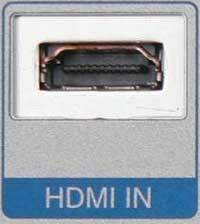 HDMI 1.4a defines resolutions up to 4K by 2K which need 300 MBPS bandwidth cables. None of the consumer gear in the shops supports anything over 1080P which can do 3D at 24Hz at 148MBPS. Bottom line: You don’t need high end HDMI cables yet. Traditionally all video and audio signals are carried over lines in an analog format.